Kitty O’Byrne’s Turf Sauce is a savoury Irish stout sauce. A versatile condiment, Turf Sauce works as a table sauce, baste, marinade, pouring and dipping sauce. It also makes a wonderful flavour enhancer and will add amazing flavour to just about anything you can cook. Turf Sauce combines Murphy’s Irish Stout, tomatoes and spice for a sweet and tangy flavour with no added salt, oil, additives or preservatives. 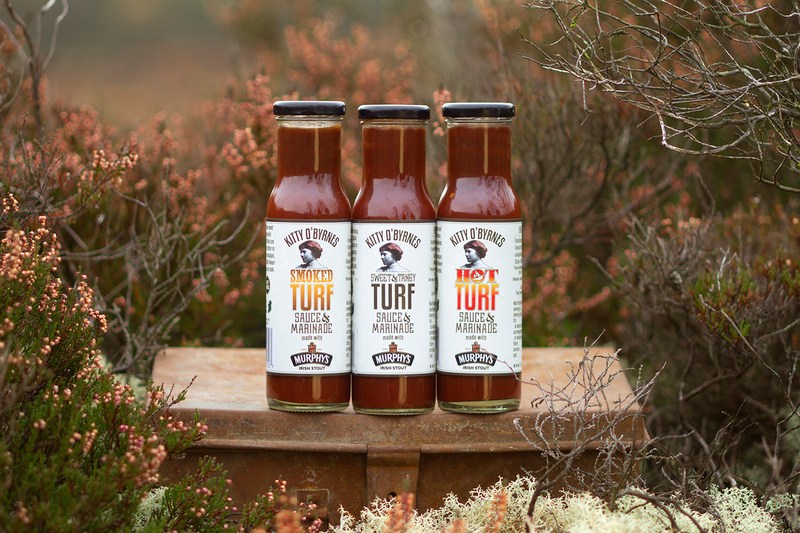 Turf Sauce is perfect for pulled pork, BBQs, sauces, gravies, pies, stews, burgers, toasted sandwiches and much more. Click here for recipe ideas. TURF – SAUCE & MARINADE a delicious sweet and tangy tomato and Murphy’s Irish Stout based sauce. Perfect as a baste, marinade or slathered on roasting meats. Smear on burgers or sandwiches. Adds flavour to just about anything you can cook. SMOKED TURF – SAUCE & MARINADE is a delicious sweet and smokey sauce made with tomatoes, Murphy’s Irish Stout and spice. Baste, marinade or slather on roasting meats. Smear on sausages, burgers or sandwiches. Perfect for ribs, chicken and steak. HOT TURF – SAUCE & MARINADE is a delicious sweet and spicy sauce made with tomatoes, Murphy’s Irish Stout and Jalapeños. Adds a fiery kick to chicken, burgers, wings, sandwiches and pizza. All Kitty O’Byrnes products are handmade, 100% Irish produced and contain no added fat, salt, additives and preservatives. Suitable for Vegetarians!